I’m writing and sipping tea at the Inn and Spa at Loretto’s Living Room bar. I come here often to write because it’s quiet, like a library. I look up as a man walks in, wearing a jacket and crisply ironed jeans. He’s accompanied by two willowy blondes. They sit on the other side of the lounge. I get back to work on my computer. Then, in a booming voice he begins a phone conversation. My writing rhythm is derailed. I look up. Only the crown of his head is visible over the back of his chair. This is my moment. “Humbert Humbert!” I announce. “I was an English major, and I can hear every word of your conversation!” I blurt. He walks across the lounge to my nook. He’s a handsome older guy with salt-and-pepper hair and a big smile on his face. “Who are you?” he asks. “Now that’s interesting!” he says, and thanks me for my literary intervention. One of the blond women summons him back with a gesture. 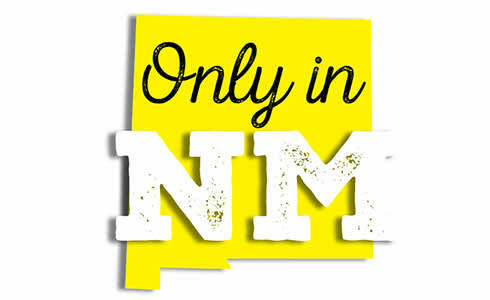 If we print your letter, you’ll get a cool cap with this clever logo: “New Mexico: not really new, and not really Mexico.”TM (You can also buy the hat at shop.nmmagazine.com.) Send your contribution with name and mailing address to onlyinnm@nmmagazine.com, or mail to Only in NM, New Mexico Magazine, 495 Old Santa Fe Trail, Santa Fe, NM 87501. Letters will be edited for style and space considerations.